The National Aerospace and Defense Contractors Accreditation Program (Nadcap) has clear and stringent guidelines for accreditation. One area that often causes problems is the incorrect handling, formatting and storage of data. The good news is that Nadcap offers a clear list of requirements, and by installing the right equipment and following some basic steps, meeting these data demands is simple. The most important thing you can do for data integrity is to work with a good partner that understands data formatting and Nadcap requirements. They’ll provide the right controllers, software and other systems to capture all necessary data, and they’ll make it easy to record and access it. Don’t settle for a vendor who is just selling a product and connecting it. Look for someone who will work with you to understand your needs and engineer a system that makes Nadcap compliance a priority. We strongly recommend SpecView software for all your supervisory control and data acquisition (SCADA) needs. Modern equipment, combined and integrated with SpecView software, will automatically record, store and backup data, and that’s a large element of meeting Nadcap requirements. 3.2.7.1.1 The system must create electronic records that cannot be altered without detection. 3.2.7.1.2 The system software and playback utilities shall provide a means of examining and/or compiling the record data, but shall not provide any means for altering the source data. 3.2.7.1.3 The system shall provide the ability to generate accurate and complete copies of records in both human readable and electronic form suitable for inspection, review, and copying. 3.2.7.1.3.1 The system shall be capable of providing evidence the record was reviewed—such as by recording an electronic review or a method of printing the record for a physical marking indicating review. 3.2.7.1.4 The system shall support protection, retention and retrieval of accurate records throughout the record retention period. Ensure that the hardware and/or software shall operate throughout the retention period as specified in 3.7. 3.2.7.1.5 The system shall provide methods (e.g., passwords) to limit system access to only individuals whose authorization is documented. OneOne additional requirement for Nadcap accreditation is from its pyrometry checklist, which stipulates that software updates and new programs installed on a system require that a cycle is run with no production materials. You can use test samples or run the system empty. 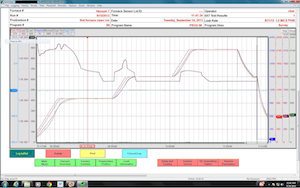 A best practice when running any cycle in a furnace is to keep a sequential log that includes a chart—including test cycles—and retain those records like you would for any other production cycle. This allows you to easily demonstrate that you followed the guidelines with the required test run. While these data guidelines are generally straightforward, the Nadcap process can be challenging. If you have any questions about equipment, software, Nadcap data guidelines or anything related to Nadcap, including the most common NCRs generated against Nadcap heat-treating checklist AC702, please contact us today. We will put you in contact with our Director of Technical Services, Jason Schulze, who has extensive, hands-on, consulting and training experience in Nadcap.